The North Sea Clothing "Adventurer" smock - Well Dressed Dad Blog! North Sea Clothing is a company with a strong background in the vintage garment trade. Dealing in classic vintage gave them the idea of have small runs of their own designs, improving and modernising vintage garments. Initially, this meant knitwear, like their great remake of the Royal Navy Submariner sweater, but increasing in range over time to result in some lovely knitwear and various other items. 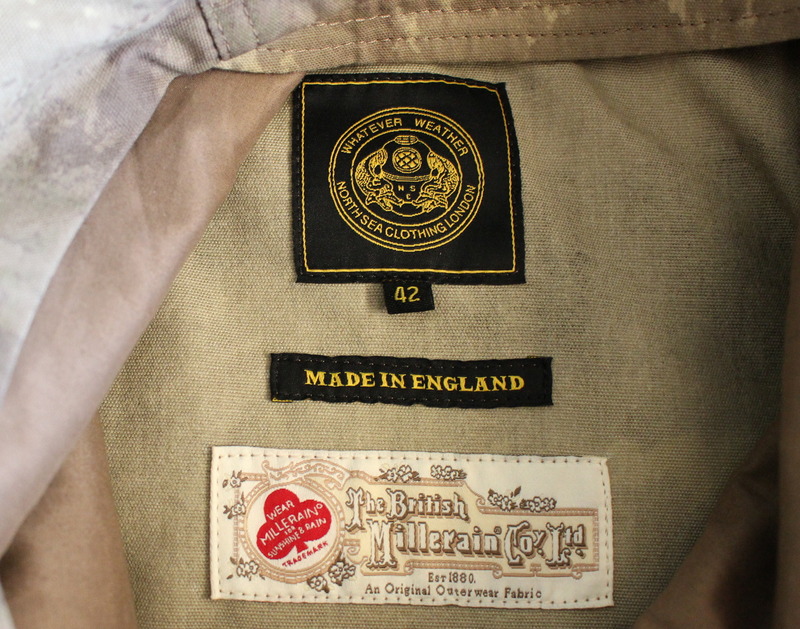 Today though I’m taking a look at their Adventurer smock. This is a great example of a design distilled down to pure functionality and then nailed into place. Any Norwegian kid that grew up in the ’70s and ’80s had a similar style of anorak for cross-country skiing. It was roomy to cover a thick wool sweater, it had pockets and a properly functional hood to keep the wind off. This is basically the same, sans the strap we used to have that went between the legs to avoid the jacket sliding up when we fell on our back. Nowadays though that isn’t as big an issue, so I’m not missing it here. The general idea is the same though. A hood that fits nice and tight and can be zipped up to seal against the wind. Fasteners on the cuffs to seal the arms as well. A practical zipped pocket for easy access to the personal communications device, and a larger dual-entry pocket for hand-warming and other gear. Let’s not overlook the drawstring waist and underarm eyelets for ventilation. Like I said, distilled down to the essentials. The fabric is a new one to me though. It’s British Millerain Staywax fabric, so basically, a waxed cotton as we know it, but very different in feel, as it feels more dry than waxy. It’s also unique in that it can be washed when dirty. Clearly classic fabrics are still being developed! The pattern on the fabric used here is a strange blended camouflage pattern. It may be an actual camouflage pattern, but I think it works perfectly as a unique point of interest. In addition to being a fine design and an innovative fabric, I deduced that the smock is in fact made at Cookson & Clegg in Lancashire. They have been in business for around 150 years now and have tremendous experience in making military grade garments, so the quality of this piece is unquestionable. So what’s it like to wear? The lack of an opening front isn’t much of an issue when putting it on. Just pop it over the head an pull down, ready for action. And it feels good! I’ve been wearing mine with a good wool sweater under when cycling in the cold. This is a good test of how it will work in other situations, as the wind chill effect of cycling fast will quickly expose any flaws. My trials were around -5C, which with a 30km/h wind (as in the speed I’m cycling) gives an effective temperature of -15C. Let me say though that any illusions of being a hero of Telemark are quickly dispelled when removing the smock (not just this one, think smocks in general). Removal is best done in private, as it’s pretty difficult to do it with any dignity (and no, there won’t be a video of this). Also, and this is something I keep forgetting: If you use eyeglasses, do remove them before taking the smock on or off or suffer bent frame syndrome. All in all, the North Sea Clothing Adventurer smock is a cracking piece of outerwear and well worth the 295 pounds asking price. Available now from North Sea Clothing.